I really enjoy portobello mushrooms, my hubs however does not love them like I do. Until now. I packed so much flavor into these mushrooms that he couldn’t help but smile after eating them. 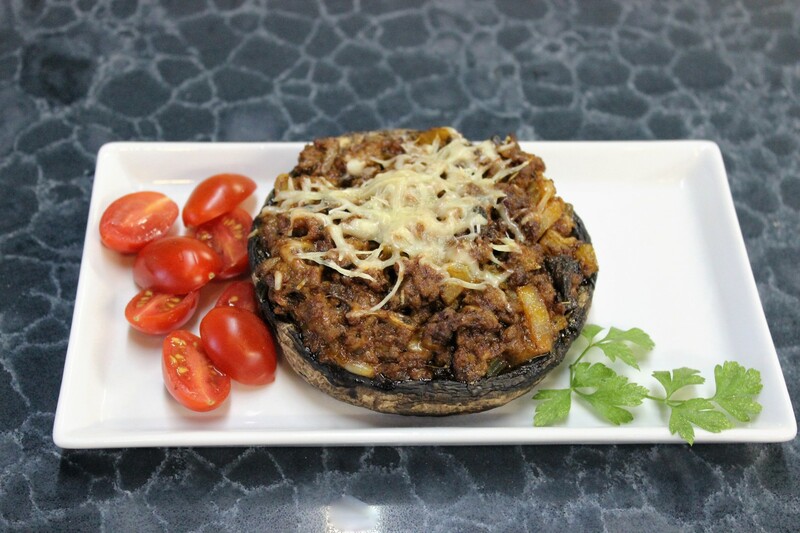 This recipe was made with the large mushrooms, however it would work just as well with baby ‘bellos or button mushrooms. They would also make a great appetizer. De-stalk the mushrooms and rinse both well. Pat dry, then place the mushroom caps on a baking pan and bake for 10 minutes. When done pre-baking, remove and pat dry. While the mushrooms are pre-baking, add coconut oil, chopped onion & celery to a saute pan over medium heat sauteing them until they become aromatic. Add garlic and stir. Chop the stalks that were removed from the mushroom and add to the onion mix and stir well. Add the ground beef, salt, Italian seasoning, and tomato paste and cook until the ground beef is no longer pink. Once ground beef is cooked, remove from heat and stir in 1/2 cup parmesan cheese. Spoon the ground beef mixture into the mushroom caps. Sprinkle with remaining parmesan cheese and bake for an additional 10-15 minutes, until the cheese is bubbly on top, then serve.